Professor Ramón "Lono" Ancho Jr.
“Lono’’ was a handful as a child. To put it nicely, he was the kid who ran the block. He had been training in Kempo karate with William Chow and his three brothers in the Palama district of Hawaii. One day, he saw a boy about his age and decided to beat him up, or as he would say it, “Give him a lickin’.” Lono started the tussle and got his bottom handed to him. A couple of days later, he saw the boy again and approached him. The boy immediately got ready for another fight, but Lono said, “No, No! I don’t want to fight. I want to know what you did to me.” The boy invited Lono to the kid’s class at Master Henry Okazaki’s dojo and started training in Danzan Ryu. He was nine years old. Prof. Okazaki called Lono “Blackie,” as Lono was always at the beach and his skin gets very dark. One day Blackie asked to leave the mat to go to the restroom. Prof. Okazaki said yes. Lono went into the restroom and out the window. He climbed Professor’s mango tree and started eating one. After a while, he looked down and Prof. Okazaki was staring up at him with his arms folded across his chest. Lono came down and ran into the dojo. Prof. Okazaki came in and said the class was going to work on Deashi Harai. Prof. called Lono up to help him demonstrate. He swept Lono over and over with the side of his instep – not the bottom of the foot – and did not hold on to him. Prof. Ancho told me he would hardly get up and Prof. Okazaki had him in the air again. Lono did not steal any more of Prof. Okazaki’s mangos. Another time, Lono was being particularly bad and not paying attention in class. Prof. Okazaki threw uncooked dry rice in the corner on the hard floor and made Lono sit seiza on the rice for the entire class. Lono paid 50 cents a month for classes from Prof. Okazaki. He would shine shoes, sell papers, dive for coins from the tourists – whatever he could do to make money, to pay for class. Prof. Ancho was not into school. He was into the beach and having a good time. At age 16, he decided to enlist into the Army. He had one of his friends sign his mother’s name so he could enlist. At the time, he could not read or write English and only weighed 118 pounds. He got his first pair of shoes, compliments of the Army, in basic training. He was amazed that he got three meals a day and his own bed. Lono never had a bed growing up; he had to sleep where he could. He found the Army’s way to be similar to Prof. Okazaki’s. He now had clothes, food, shelter, and he got paid! He was in heaven.After boot camp and advanced training in Hawaii, he was sent to Germany in the fall of 1945. He had never experienced cold weather, let alone snow. He was miserable. One of the sergeants told him if he signed up for jump school they would send him back to America for training. He signed up immediately. The next morning, he was called to headquarters (HQ) and told that he had been accepted. He was sent across base with new orders. Lono was thrilled to be getting out of the cold and snow. He went to the new HQ and was told to go to the hanger. The sergeant showed him how to do a land-and-roll maneuver. Lono practiced the fall a few times. Then was told to stand up on a box, jump off and do it. He did this about three times and the Sergeant said he was ready to go. Lono asked when he was going to go to American for his training, and was told he had just had it. That afternoon he had his first jump. In this military career he had 3,639 jumps – many at night and at high altitude. He had a friend write a letter to his mother and Lono signed it. She wrote back and told Lono she was proud of him, and that she didn’t know he could write so well. He never told her that his friend wrote the letter. Instead, he started to learn to read and write. While in Germany, he was part of the security team at General Dwight D. Eisenhower’s residence. Also during this time, he received his black belt certificate from Prof. Okazaki. He was the All Service boxing champion (130 pound division) many times. He was preparing to represent the United States at the 1948 Pan American Games, when he was called to duty. One of his stories happened while assigned at Ft. Bragg, N.C. He was with a beautiful redhead in the early 1950’s just walking down the street in Fayetteville. Remember Prof. Okazaki’s nickname for him, Blackie? Well, a group of young men made a comment to Lono. The word started with “N.” Lono, not wanting trouble, went and put the young lady in the car and got into the driver’s seat. One guy came over and reached in to grab him. Lono wrist locked him and wound the window up on his arm. Then he opened the door, got out, and wham! Knocked the guy out. Just as the guy’s associates started to get riled up, police arrived. The troublemakers told police that this “N” person was causing a problem. They then turned to Lono and said, “Mr. Ancho, are these guys giving you a hard time?” Lono replied there was no problem now. Lono had been teaching the local law enforcement control tactics. He was assigned to Welfare and Recreation and he was the lifeguard at an indoor pool. A group of 10 men came in one time and were being disruptive. On the hour, Lono blew the whistle for everyone to get out of the pool. One guy resisted. The man told Lono to come in and make him get out. Lono told him that if he had to come in the man had better be able to hold his breath longer than three minutes because Lono was going to drown him. At that point, Lono noticed he was surrounded by the man’s associates. Then it began. Three days later he was called before the post commander. When Sgt. Ancho came in, he saw all 10 of the guys there with cuts and bruises. The commander asked Lono if he was OK and what charges he would be filing. Lono said, “Sir, you will have to ask them about the charges. They are filing them on me.” The commander said he wanted to hear this one. After all was said and done, the 10 guys, all Military Police, were sent to new companies with less money, and the commander shook Lono’s hand. Lono served as an instructor to the 82nd Airborne Division, 1st Special Forces Group, 5th Special Forces Group, West Point Military Academy, and U.S. Special Warfare School. Prof. Ancho did one tour in WWII, two tours in Korea with Special Forces and six tours in Vietnam with Special Operations Group (SOG). He is still talked about today at Ft. Bragg. Most SOG missions were three to seven days in the field. Professor was in the field, sometimes in where U.S. forces were not officially allowed, for up to four months at a time. He survived three blood rituals with the Hmong tribesmen. The rule of thumb for SOG was a 105-to-1 kill ratio. Professor’s teams had a much higher rate, and he was known for bringing everyone home safely.His enlightenment came in 1968. He was visiting an Army company in the field when they were hit by a large North Vietnamese force. They were overrun. He was shot, but still alive. He had five rounds still in his weapon. He knew he could get up and get five more but would not have a chance after that. He played dead. A soldier came up and bayoneted him twice in the back. He did not move, or it would have cost him his life. They dug a mass grave and threw everyone in. He was lucky and was thrown in on top, face down, with his head between another soldier’s legs. They piled two feet of dirt over them and left. He was in the ground nearly 30 hours with more than 100 soldiers. He told me he visited Prof. Okazaki and all of his friends and family during that time. At the moment he was about to give up, he said to himself, “God, I will do your work as long as I live.” He did not say if you get me out of this, I’ll do your work for as long as I live. That is when they dug him up. He has been doing God’s work since. Prof. Ancho was able to blend into many cultures. He spoke seven languages. Remember when I mentioned him entering the Army, he could not read or write? He practiced his handwriting two hours a day. Prof. earned his General Education Diploma (high school equivalency) and went on to college. When Prof. Ancho was brought to the West Point Military Academy, he was a Sgt. 1st Class. He was the only full instructor at the academy who was not an officer. At the academy, he was accelerated through the ranks and was a major by 1975.The West Point judo team had not won a match in more than three years when Prof. Ancho began coaching it. Three years later, the team was undefeated under his tutelage. He was also the hand-to-hand combat instructor at West Point. At the end of the first day of hand-to-hand training, he had broken 37 elbows. This was not done out of meanness. Just three weeks prior to this, he was involved in special ops in Vietnam. He recounted this story during the AJJF Convention in Boise, Idaho, in 2000. He said he was called in by the commanding officer (CO) to explain. The CO had reviewed his file and saw that Prof. Ancho was from Hawaii, where the commander had been stationed. They got to talking about the islands, and nothing was said about the broken arms until he dismissed Prof. Ancho. The CO asked him to go a little easier on the men. Prof. Ancho instructed celebrities Ricardo Montalban, Tony Curtis and acted as bodyguard for Martha Raye. He appeared in movies, The Naked and the Dead, Beachhead (with Tony Curtis and Janet Leigh), Get Set, Go, and on television with Ed Sullivan, Steve Allen and Jack Parr. According to a tribute on Sensei George Arrington’s Web site (www.danzan.com) Prof. Ancho also held senior rank in Kempo Karate, the title of professor in Kodokan Judo, and the title of Presiding Elder in the Kodenkan Danzan-Ryu Jujitsu Association, and he ran the Kodenkan Hombu dojo in Costa Rica. 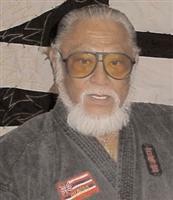 Professor Ramón “Lono” Ancho Jr. — a master of several martial arts, a decorated war hero and a loving, trusted friend — died of a stroke on Jan. 27, 2003 at the age of 74. He was cremated following a Catholic ceremony in King, N.C. Prof. Ancho’s spirit inspires and steels the spirit against adversity. These are my recollections of a few of the stories by and about Lono.